After introducing a whole bunch of neat cast members such as Patton Oswalt, Jonah Ray, Felicia Day, the Mystery Science 3000 has ended, raising a record-breaking $5.76 million dollars. In addition to the Kickstarter, Joel Hodgson was able to raise $600,000 for a total of $6.3 million, which will fund an additional 14 episodes. 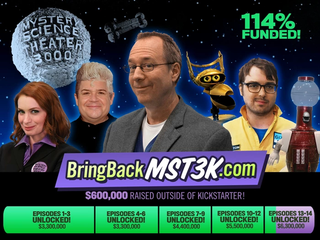 You did it: you brought back MYSTERY SCIENCE THEATER 3000! Thanks to you, MST3K will be able to shoot FOURTEEN NEW EPISODES next year, including a new holiday special!